Optimizing management practices at the plot scale is sometimes not sufficient to reach water framework directive objectives for nitrate pollution. Land management measures involving targeted setting aside of croplands is a promising solution, but its efficiency depends on the local context. We used a distributed agro-hydrological model to compare management interventions intended to decrease vertical and lateral nitrate leaching from soil to groundwater and stream water in two contrasted agricultural catchments. The simulated scenarios combined two strategies: optimization of agricultural practices and land-use conversion from agricultural to natural land at different locations within the catchments. Long-term climate, discharge, and nitrate concentrations have been monitored for the two catchments and agricultural practices are well known over the 13-year simulation period (2002–2015). The Kervidy-Naizin site (KN) is subject to intense livestock pressure with mean nitrogen inputs of 257 kg ha−1 year−1, while the Auradé site (AU) is primarily cereal cultivation with nitrogen inputs of 109 kg ha−1 year−1. The results highlight a large nitrogen legacy in KN, resulting in a progressive and long lived (> 10 years) response to changes in management, while in AU, this response is perceptible after only 5–7 years. For both catchments, the most effective scenario involves wide riparian buffer strips in interception position covering about 15% of the catchment area. In KN, this land conversion scenario, simulated with the agro-hydrological model TNT2, created a decrease of nitrate concentration in stream water by 25% versus 15% in AU. Contrastingly, the implementation of best management practices decreased stream nitrate concentration only by 9% for KN and 4% for AU. The online version of this article ( https://doi.org/10.1007/s10705-019-09985-0) contains supplementary material, which is available to authorized users. This work was funded by the French National Research Agency (ESCAPADE project in AGROBIOSPHERE program, ANR-12-AGRO-0003) and by Agence de l’Eau Adour Garonne (BAG’AGES project). For Kervidy-Naizin, the farm surveys were performed within the MOSAIC project of the AGROBIOSPHERE program, ANR-12-AGRO-0005. The grant of the first author was co-funded by Arvalis. The authors are very grateful to all the staff of the Agrhys Observatory, especially to S. Busnot, Y. Hamon, M. Faucheux and N. Gillet (field work), G. Le Henaff (databases) and P. Pichelin (GIS). 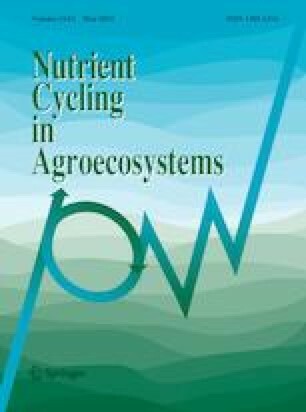 For Auradé, the authors would like to thank the ‘Groupement des Agriculteurs de la Gascogne Toulousaine’ (GAGT for farm surveys data), E. Guigues and V. Payre (farmers agricultural practices database), V. Ponnou-Delaffon (for contribution in hydrochemical database compilation), S. Sauvage and J.M. Sanchez-Pérez. The two experimental catchments, Kervidy-Naizin and Auradé, belong to the French Research Infrastructure OZCAR (Observatory of the Critical Zone: http://www.ozcar-ri.org/).